We all knew it was coming, but Nintendo finally broke down and gave us some new information on Pikmin 3 for the Wii during this morning’s press conference. 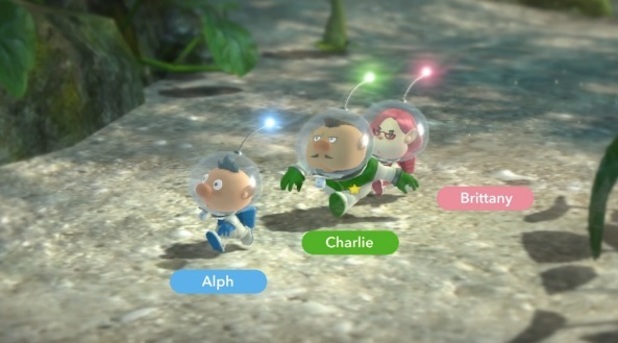 For the first time in the series, players won’t be controlling fan favorite Olimar, but will instead be taking control of three new adventures named Brittany, Alph and Captain Charlie. The trio of adventures have crash landed on a new planet while trying to find some new food sources, and now have to convert food into rocket fuel if they ever want to get home. Pikmin 3 will take advantage of the Wii U’s GamePad by letting players control their Pikmin and use it as a general map. If you prefer, you can still use your Wii U Pro Controller or Wii-motes, which unlocks the ability to use the GamePad as your monitor. It seems so basic, but this is the kind of flexibility that the Wii U offers that’s unlike any of the other home consoles, and I can’t help but feel like I’m living in the future when I see it in action. There’s still a lot we don’t know about the game, and with a Summer release just around the corner, we’re bound to find out more in the near future, but I can’t help but speculate a bit here. With all three characters being used on the map at once, it seems that co-op would be a no brainer. Now, Nintendo has hinted that we won’t see this, but a guy can dream, right? Pikmin 3 will be touching down in North America on August 4th, while those of you in Europe will get your hands on it July 26th.